Connections—A Norsat International / DCI Perspective, DCI Teleport required a reliable fly-away terminal that was airline checkable, durable, and easy-to-use. DCI Teleport provides video transmission and production services to the broadcast community and Federal Government in and around Washington, DC. The teleport industry got its start in the days when monopoly telephone companies ruled and, in the U.S., COMSAT was the sole gatekeeper for access to domestic and international satellites. Then the Reagan Administration’s Open Skies policy ended COMSAT’s lock on satellite access, and entrepreneurs jumped on the new opportunity. 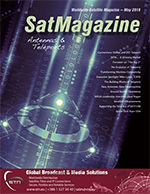 Last year, Intelsat (together with chip-maker Intel) made a suggestion to use some of their C-band satellite frequencies to help boost the roll-out of 5G services over congested U.S. cities and urban areas — at the time, SES (which has significant C-band frequencies in use over North America via its ‘Americom’ satellites) was cold on the idea. The buzz in the commercial satellite industry over the past five to ten years has been about those who could design and build the highest capacity satellites, those who could launch the heaviest payloads into space and, of course, those who could operate these satellite systems with the best business proposition to their users. Transforming Maritime Connectivity —A KVH Focus, By Elizabeth Jackson, Chief Marketing Officer and Senior Vice President, Strategy, KVH Industries, Inc.
A sea change is underway throughout the maritime industry, driven by the importance of connectivity for today’s vessels and new High Throughput Satellite (HTS) technology. These HTS antenna systems are key agents of that change. Mr. Lyons is currently a Partner with the Ratio Academy, a developer of online and corporate entrepreneurship and tech company management programs delivered worldwide. A telecommunications port — or, as they are more commonly known, teleport — is a satellite ground station that functions as a hub that connects a satellite or geocentric orbital network with a terrestrial telecommunications network, such as the internet, via Earth Station Antennas (ESAs). For several decades, satellite antennas have grown smaller, lighter, more capable and much more nimble — they have opened up new market opportunities with each technological advance. Driven by commercial solutions, with improved timeliness, availability and affordability in the entire value chain, any type of company is now able to launch their payload to space. However, what thought is being given to the ground operations and communications for these LEO satellites? Space Flight Laboratory (SFL) opened their doors 20 years ago with a commitment to push the envelope as far as what smallsats could accomplish. Satellites are at the heart of the technological developments shaping our era — they affect the way we live without many even realizing their crucial contributions: satellites make us safer, predict the weather, provide modern conveniences, broadcast entertainment, and implement ubiquitous communications, among other services. During the past couple of decades, the satellite industry has been developing at an unprecedented rate.